Welcome to art! The students in grades 1- 5 have art class every Friday. The kindergarten classes rotate every other Friday. An outline of the art program is below. The “Art Gallery” is open for all families to come and see all the wonderful works of art the students have created. Please feel free to come by and admire the artist’s work. Grades K-2 learn through exploration in art class. Each lesson introduces an element of art to expand on their basic understanding of line, pattern, color, shape and design. 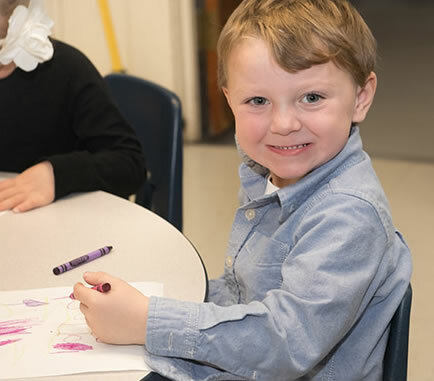 Creativity is encouraged as they learn about the elements of art through a variety of projects and materials. We give creative freedom within the lessons help the students develop an appreciation for art. In grades 3-5 we expand on the basic elements of art and begin to incorporate new concepts. They are also discovering an awareness of line pressure, color, color mixing, and sculptural elements to bring depth to their artwork. The students are also introduced to artists with each project to add to their knowledge of art. When students are introduced to and begin to understand the various techniques and artists, they develop a deeper appreciation for art. The computer technology program at St. Mary’s is designed to support the development of strong and lasting technology skills. 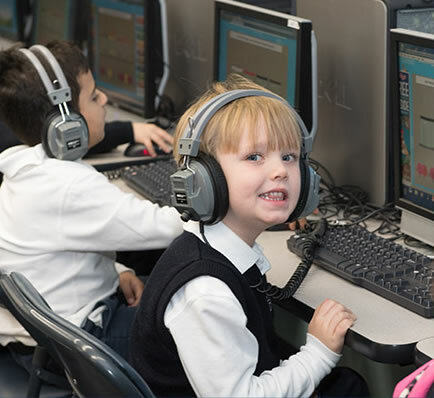 St. Mary’s provides computer education to students in Pre-school (4 year old) through 5th Grade once a week in a computer lab setting. The lab is equipped with desktop computers for every student, printers (including a new 3D printer), and the school also has 2 carts of IPads for the students to utilize in the general classrooms and/or the lab. In this weekly technology class, students will strengthen and enhance basic computer skills, and be exposed to ever emerging technology. Some of the many areas we will cover in this class are the following: mouse and keyboarding skills; paint/draw programs; word processing; spreadsheets and graphing; slide presentations; multimedia; internet research and internet safety; coding and game programming; and 3D design and printing. In addition, one of the most important goals of the computer technology program is to integrate the technology curriculum with the general classroom curriculum at every opportunity. Working with classroom teachers to ensure that students are applying their technological skills to other academic areas is a key element of this program. If you have any questions, please contact the technology teacher, Mrs. Good, at egood@stmaryswinchester.org. 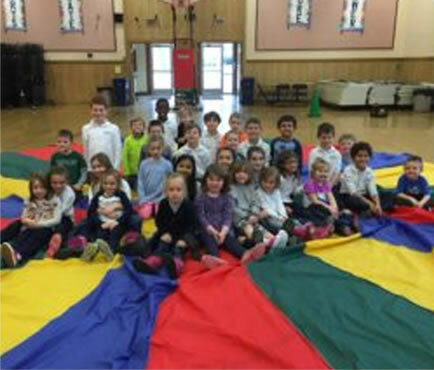 The Physical Education program at St. Mary’s School is offered to all students in grades Pre-K thru Grade 5, covering a wide range of skills, games, sports and fitness activities. Physical education class takes place once a week for students in grades K-5, and twice a week for the PreK classes. Physical education class for students in the younger grades is skill based. Working on skills such as running, hopping, galloping and skipping, along with basic throwing, kicking and bouncing skills. Students also build confidence and begin learning about good sportsmanship. 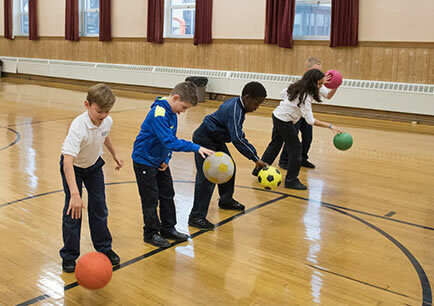 Physical education class for students in the upper grades focuses on teamwork and cooperative learning, while continuing to develop the skills needed to participate in sports and physical activity. Your class comes to library on Thursdays. Please remember to bring your book to school so you can check out a new one. We will have lots of fun reading new books and learning important library skills. Is there a book you wish the library had? Send Mrs. Powell an email and she will add it to our wish list! We are always looking for new-to-us (but still in good condition) books to add to our collection. If you have books to donate, please contact Mrs. Powell. Contact Mrs. Powell for some good links & resources regarding literacy and library skills. Students should be able to match pitch, find and maintain the macro beat of a given piece, and be able to perform and read a simple ostinato pattern on a soprano Orff xylophone. Additionally, all students should have a general knowledge of the Italian musical terms for tempo, dynamics, and parts of the staff. Students are able to read rhythmic patterns which are reproduced on rhythm instruments. Children learn to sing in unison and eventually move to partner songs and rounds. A broad variety of literature is employed from American folk songs through multi-cultural literature. The major instruments and their component groups are studied through the musical literature that is presented through their music classes. 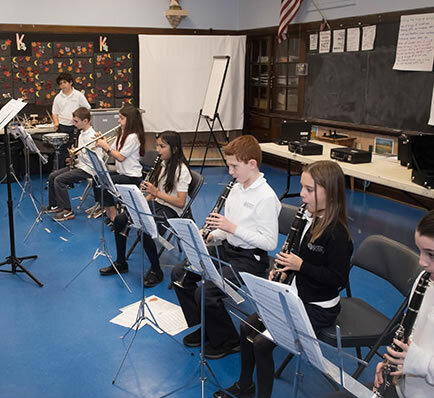 The music program is largely based on the music learning theory research done by Dr. John Feierabend of the Hartt School of music in combination with the principles of Kodaly and Suzuki music educational systems. This methodology is vocally based and relies on the belief that students should be fluent in the “language of music” through folk literature. Through this body of familiar language, students learn to audiate (hear and reproduce vocally the sounds they hear) and eventually, learn the note patterns and terminology of music as they grow through the program. The Kodaly solfege hand symbol system is used to give children an awareness of intervallic relationships and to begin being conversant beyond simply replicating a unison pitch. Students in the preschool and kindergarten grades sing simple songs and use their bodies as the scale to denote pitches that are high, medium, or low. As students progress, they are exposed to the solfege system. Lastly, students see the notes they have sung on a staff and are able to use xylophones to repeat ostinati or create their own. Rhythmically, students progress from feeling the macro beat of a song using clapping, rhythm sticks, or even a bouncing ball in the primary grades, to being able to transcribe or recognize a written rhythmic pattern. Any music literature introduced at a grade level always takes into consideration the developmental age of the group. Songs based on the easiest melodic patterns are used first (sol –mi, sol-la-sol-mi, mi-re-do) and progress into any number of tonal and rhythmic patterns as the child advances through to grade five. The classroom music program is built largely on folk music from all cultures. True indigenous folk music crosses all barriers by being based largely on pentatonic scales and melodic patterns that are easily accessible to young singers. It is the ideal basis upon which to build a music program. As referenced earlier, our annual spring musical is always based on a theme that encourages cooperation, tolerance of each other, and respect for people of different ethnicities. The music chosen for our monthly Liturgies further espouse the Christian values of the Golden Rule. Improvisatory songs that allow the children to fill in their part serves essentially as small solo pieces that I can judge whether a child is able to match pitch. These songs begin at the earliest levels. Percussion instruments such as rhythms sticks and hand drums allow me to assess whether students are able to find and maintain a constant beat. Through simple audiation exercises used with the fourth and fifth grades, I assess which students are able to follow a musical pattern and are able to read a melodic ostinato. Rhythmic dictation is another tool to assess whether students are able to read rhythmic patterns. How much time is allotted for the subject? Each grade receives 30 minutes of music instruction weekly, with the exception of the Pre-K class which receives 20 minutes weekly. A school choir which is open to the fourth and fifth grades meets during their 30 minute recess period once or twice a month as needed. During the months of December and May, when the school show is in preparation, music periods are extended to 40 minutes and a few additional classes are added which serve as dress-rehearsals. 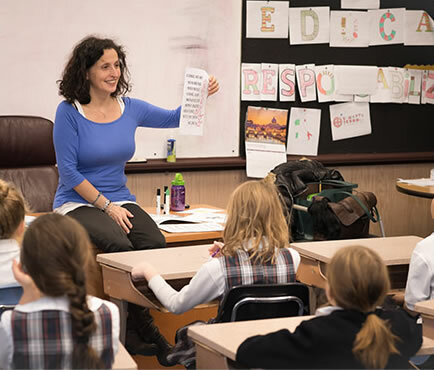 The Mandarin program is designed for the students to achieve academic proficiency in both English and Mandarin and become bilingual, bicultural and biliterate. Enriches and enhances a child’s mental development. Improves a child’s understanding of his/her native language. Gives a child the ability to communicate with people s/he would otherwise not have the chance to know. Gives a student a head start in language requirements for college. Email Ms. Cristiano using the Contact Form Below for more information. 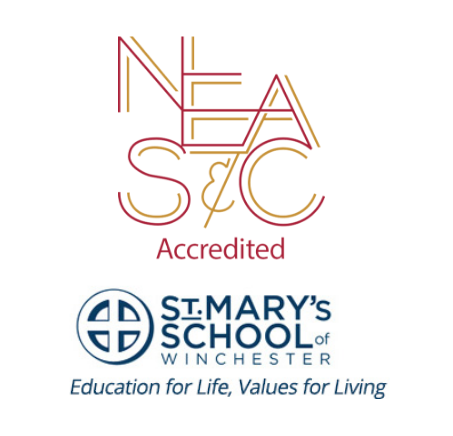 St. Mary’s School in Winchester received continued accreditation from the New England Association of School and Colleges (NEASC). 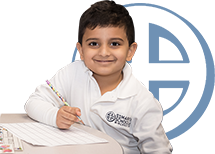 The accreditation report identified many areas of commendation for St. Mary’s School particularly commending the entire school community for developing a new mission statement which guided the entire self-study process. 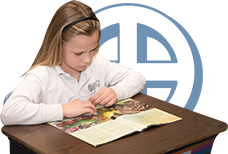 The report additionally commended the administration and faculty for their dedication to the mission of St. Mary’s School and the support of the PTO for providing additional resources including a new Science Closet and a Literacy Room. The NEASC website describes the accreditation process as “a system of accountability that is ongoing, voluntary, and comprehensive in scope. It respects differences in institutional populations, missions, and cultures, and fosters institutional change grounded in the judgment of practicing educators. It is based on standards which are developed and regularly reviewed by the members and which define the characteristics of good schools and colleges.” It is structured in a ten-year cycle of self-study, peer review and follow up. NEASC accreditation attests to: substantial compliance with established qualitative standards; integrity in statements to the public describing the institution’s program; institutional commitment to improvement and sufficiency of institutional resources.